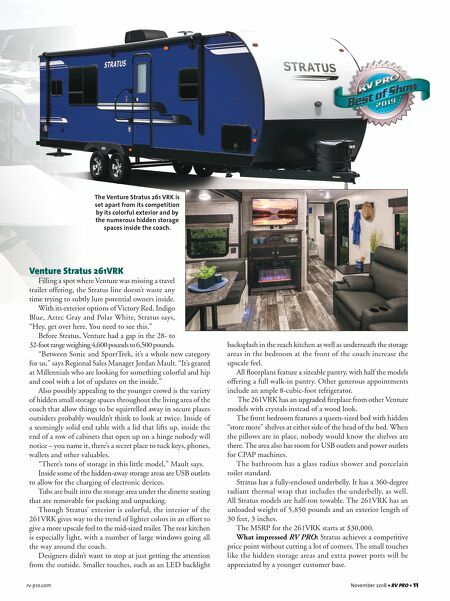 rv-pro.com November 2018 • RV PRO • 11 Venture Stratus 261VRK Filling a spot where Venture was missing a travel trailer offering, the Stratus line doesn't waste any time trying to subtly lure potential owners inside. With its exterior options of Victory Red, Indigo Blue, Aztec Gray and Polar White, Stratus says, "Hey, get over here. You need to see this." Before Stratus, Venture had a gap in the 28- to 32-foot range weighing 4,600 pounds to 6,500 pounds. "Between Sonic and SportTrek, it's a whole new category for us," says Regional Sales Manager Jordan Mault. "It's geared at Millennials who are looking for something colorful and hip and cool with a lot of updates on the inside." Also possibly appealing to the younger crowd is the variety of hidden small storage spaces throughout the living area of the coach that allow things to be squirrelled away in secure places outsiders probably wouldn't think to look at twice. Inside of a seemingly solid end table with a lid that lifts up, inside the end of a row of cabinets that open up on a hinge nobody will notice – you name it, there's a secret place to tuck keys, phones, wallets and other valuables. "There's tons of storage in this little model," Mault says. Inside some of the hidden-away storage areas are USB outlets to allow for the charging of electronic devices. Tubs are built into the storage area under the dinette seating that are removable for packing and unpacking. 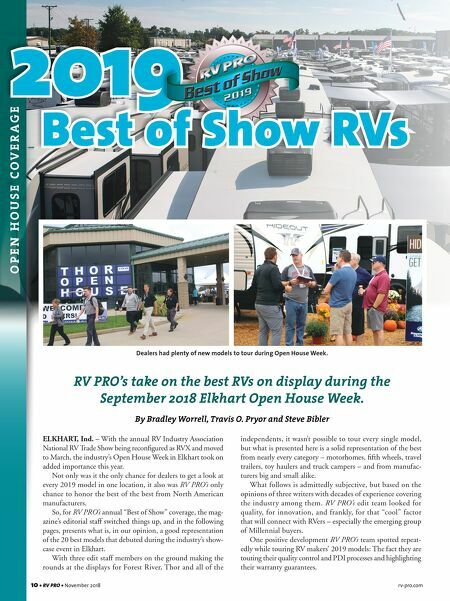 Though Stratus' exterior is colorful, the interior of the 261VRK gives way to the trend of lighter colors in an effort to give a more upscale feel to the mid-sized trailer. The rear kitchen is especially light, with a number of large windows going all the way around the coach. Designers didn't want to stop at just getting the attention from the outside. Smaller touches, such as an LED backlight backsplash in the reach kitchen as well as underneath the storage areas in the bedroom at the front of the coach increase the upscale feel. All floorplans feature a sizeable pantry, with half the models offering a full walk-in pantry. Other generous appointments include an ample 8-cubic-foot refrigerator. The 261VRK has an upgraded fireplace from other Venture models with crystals instead of a wood look. The front bedroom features a queen-sized bed with hidden "store more" shelves at either side of the head of the bed. When the pillows are in place, nobody would know the shelves are there. The area also has room for USB outlets and power outlets for CPAP machines. The bathroom has a glass radius shower and porcelain toilet standard. Stratus has a fully-enclosed underbelly. It has a 360-degree radiant thermal wrap that includes the underbelly, as well. All Stratus models are half-ton towable. The 261VRK has an unloaded weight of 5,850 pounds and an exterior length of 30 feet, 3 inches. The MSRP for the 261VRK starts at $30,000. What impressed RV PRO: Stratus achieves a competitive price point without cutting a lot of corners. The small touches like the hidden storage areas and extra power ports will be appreciated by a younger customer base. The Venture Stratus 261 VRK is set apart from its competition by its colorful exterior and by the numerous hidden storage spaces inside the coach.